Background: The island of New Guinea is located midway between the world's two major melioidosis endemic regions of Australia and Southeast Asia. Previous studies in Papua New Guinea have demonstrated autochthonous melioidosis in Balimo, Western province. In contrast to other regions of endemicity, isolates recovered from both environmental and clinical sources demonstrate narrow genetic diversity over large spatial and temporal scales. 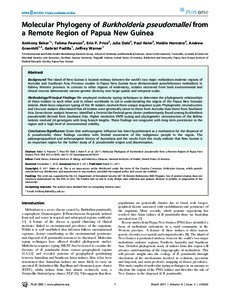 Methodology/Principal Findings: We employed molecular typing techniques to determine the phylogenetic relationships of these isolates to each other and to others worldwide to aid in understanding the origins of the Papua New Guinean isolates. Multi-locus sequence typing of the 39 isolates resolved three unique sequence types. Phylogenetic reconstruction and Structure analysis determined that all isolates were genetically closer to those from Australia than those from Southeast Asia. Gene cluster analysis however, identified a Yersinia-like fimbrial gene cluster predominantly found among Burkholderia pseudomallei derived from Southeast Asia. Higher resolution VNTR typing and phylogenetic reconstruction of the Balimo isolates resolved 24 genotypes with long branch lengths. These findings are congruent with long term persistence in the region and a high level of environmental stability. Conclusions/Significance: Given that anthropogenic influence has been hypothesized as a mechanism for the dispersal of B. pseudomallei, these findings correlate with limited movement of the indigenous people in the region. The palaeogeographical and anthropogenic history of Australasia and the results from this study indicate that New Guinea is an important region for the further study of B. pseudomallei origins and dissemination.